We will go to Eskihisar Ferry port and board the ferry to cross the Marmara Sea. After a one hour cruise we will arrive in Yalova port and keep on driving to Bursa. The city is known as " Yesil Bursa" (meaning "Green Bursa") for its beautiful parks and gardens throughout the city. The city is famous for its ski resorts (on the mountain of Uludağ), the mausoleums of Ottoman sultans, the surrounding fertile plain, thermal baths and Karagöz & Hacivat shadow puppets. Bursa was the first capital city of the Ottoman Empire. It is also home to some famous Turkish food, especially chestnut candy, peaches, and a meat dish called İskender kebap. Lunch will be served in a special Iskender Kebap restaurant. 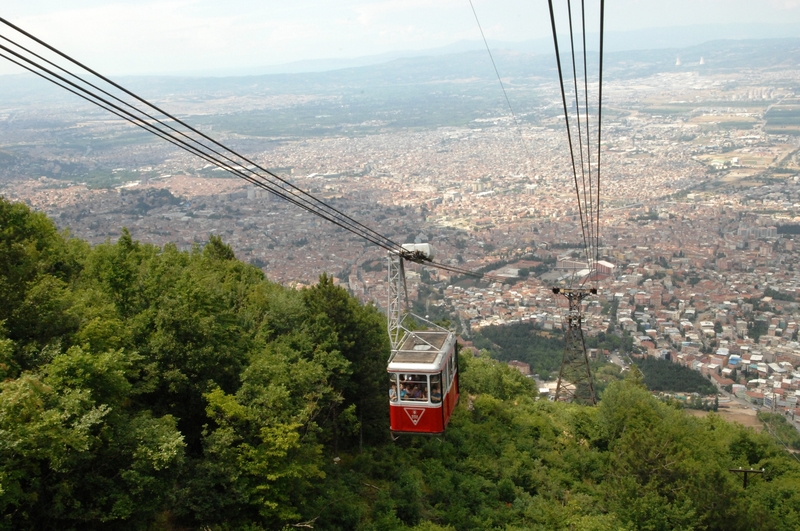 We will visit the historical Covered Bazaar and the old Silk market, then take the cable car to Uludag (Olympos) mountain overlooking Bursa for the magnificent panoramic view. After visiting Bursa Grand Mosque (Ulu Camii) and Green Mausoleum, famous for their Iznik tiles, we will drive back to Yalova, get on the ferry and cross the Marmara Sea to Istanbul. Then we will take you back to your hotel. Bursa is a city in northwestern Turkey. It is the fourth most populous city in Turkey and one of the most industrialized metropolitan centers in the country. Bursa was the capital of the Ottoman State between 1326 and 1365. The city was referred to as "Hüdavendigar" (meaning "God's Gift") during the Ottoman period, while a more recent nickname is "Yeşil Bursa" (meaning "Green Bursa") in reference to the parks and gardens located across its urban tissue, as well as to the vast forests in rich variety that extend in the surrounding region. The city is synonymous with Mount Uludağ which towers behind its core and which is also a famous ski resort. The mausoleums of the early Ottoman sultans are located in Bursa and the numerous edifices built throughout the Ottoman period constitute the city's main landmarks. The surrounding fertile plain, its thermal baths, several interesting museums, notably a rich museum of archaeology, and a rather orderly urban growth are further principal elements that complete Bursa's overall picture. Karagöz and Hacivat shadow play characters were historic personalities who lived and are buried in Bursa. Bursa is also home to some of the most famous Turkish dishes such as İskender kebap, specially candied marron glacés, peaches and lokum. Bursa is home to the Uludağ University, and its population attains one of the highest overall levels of education in Turkey. Within the Bursa Province, the towns of İznik (Nicaea), Mudanya and Zeytinbağı are especially notable for their long history and important monuments. According to the Turkish Statistical Institute, as of 2011 the city of Bursa had a population of 1,704,441 and its metropolitan municipality 1,948,744.